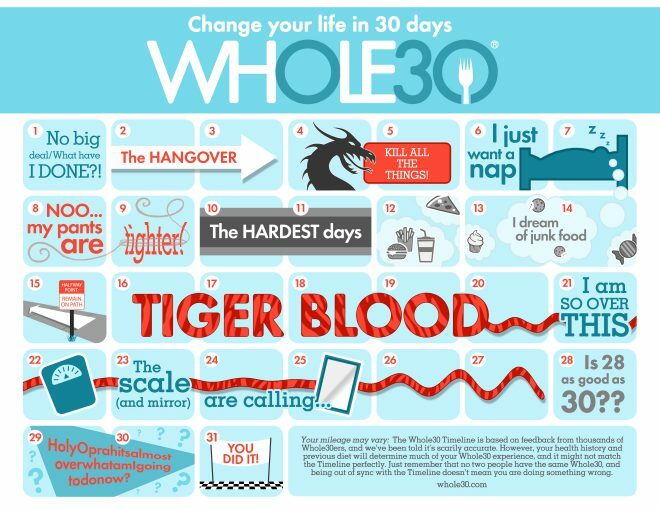 The whole30 it a dietary reset program, intended to reset your body from inflammation within the 30 days, as long as you follow the program. It also helps you kick the sugar dragon, and help you get better habits. You leave out legumes, grains, dairy and sugar, you don’t make any substitutes, like bread, pancakes, desserts. You eat three times a day, and your plate holds 1/3 veggies, palm full of meat and a thumb size fat. That should keep you full until next meal, or else you put more protein and fat on you plate. Simple…. I have been on a million diets, well it feels like a million. Many of them worked, as long as I followed the guidelines, but when I stopped I gained the weight back – sometimes even more. I don’t want to diet, I want to be healthy, and those two things doesn’t fit together in my book. It is all my million diets that f….. up my relationship with food. I eat when I am happy, I eat when I am sad, I eat when I am bored, I eat when there is a special occasion. Why is it that food has become such a social thing, you can’t do anything with anyone without it involving food. Don’t get me wrong, I love food, and I love cooking and having guests. As long as it is me controlling the food and not the food controlling me. I did my first whole30 in July 2017 together with my husband Lasse, who is a diabetic. I did it to learn more about how certain food groups affect me and to help Lasse control his blood sugar levels. After the first week, Lasse had dropped all his medication, but felt horrible because of the blood sugar dropping. I had some cravings, but otherwise ok. The second week we went to a conference in Chicago for 5 days, and managed to stay compliant for the whole trip. Third week we felt great, had so much more energy, no bloating, we both felt great. And that lasted for the rest of the round. When we hit day 31 we started the reintroduction. The way it works, is you reintroduce one food group at a time. I knew gluten wasn’t my friend, but that I both reacted to legumes and dairy was a surprise. That is a very short resume of the round, but the important part came after. It is easy to say no, and stay on plan for 30 days, the real challenge comes after. I felt so good after the round, I had so much energy, I worked out 5-6 days a week, and got some amazing habits. Eating only 3 times a day, not snacking. I say all this in past tense, because it fell a little a part during our trip to Denmark and Christmas. But this is still a victory because it didn’t mean I went completely of the rails. And come January I started round 2 to get the good habits back. I am currently on day 17, or it would have been day 17 if Lasse hadn’t bought the wrong bacon, it contained sugar, so technically I am on day 4. This round have been different, we started on January 1st, and I went through all the symptoms, tired, ready to kill all things, and I was tired – exhausted, this is normal for the 1st week, but for 2 weeks straight, I started to worry, I couldn’t do anything, when I woke up i just wanted to go back to bed. I felt horrible, and Friday I had enough and so had Lasse, because I might have taken it out on him a bit. So he went through all the things he could think it could be. All of a sudden he asks me if I know what my blood sugar level is. I don’t, so we take it and it is low, like coma low (which explains the zombie state I have been in). He feeds me some fruit, and I immediately feel better. During the weekend I started eating more, getting more fat. Drinking coconut water when working out, and now I am back to normal It is crazy how much that blood sugar affects you. Because Lasse has the blood sugar monitor we have measured my blood sugar before and always known it was low, but this was crazy. I don’t know what it means, I just know I always need to have some food with me. It doesn’t change the fact, that this way of eating is the way that make me feel best. I look forward to experiencing how my body will react for the next couple of weeks.